Editor’s Note: With the summer season upon us (besides all this rain from Tropical Storm Cindy), the streets start to thin with people. College students have gone home, locals have fled to their summer homes, and the wait at restaurants dwindles. To get you out in those streets and into those restaurants, we are spotlighting some of our favorite places. First up, Mother’s. Mother’s Restaurant was founded in 1938 in New Orleans, and still serves up its specialty po’ boy sandwiches and baked hams. The restaurant has been run by two families in its long history, and has closed only during Hurricane Katrina. Mother’s is open 7 am-10 pm Monday through Sunday. The restaurant changed ownership in 1986, when it was acquired from the sons of the Landrys, Jacques and Eddie, by Jerry and John Amato. The only changes to the menu over the years has been the addition of more menu items.The physical restaurant also remains virtually unchanged to this day, except for the addition of a neighboring facility titled Mother’s Next Door. Mother’s Restaurant was temporarily closed during Hurricane Katrina, the first time in its history. (“History of Mother’s.” Mother’s Restaurant. (2011): n. page. Web. 31 Oct. 2011). In 1986, Jerry and John Amato took over membership from the Landry family. Jerry took over as chef and John became a silent partner and financed the venture. Locals worried that the change in ownership might render it less original and homey. However, the new chef did not eliminate or change any of the recipes that had made the restaurant so popular. Amato did add some typical New Orleans favorites to the menu, and expanded hours as well. Now, in a typical business day, the restaurant sees as many as 2,500 costumers, with the average being around 1,500 per day. The restaurant has 60 workers and Amato oversees every dish sent out of the kitchen. (“Just Like Mother’s Used to Make.” Restaurant Business. (1992): p72. Print. 2 Nov. 2011). Mother’s became a popular local establishment for a number of menu favorites. The Ferdi Special consists of both roast beef and Mother’s famous baked ham on a po’ boy served with debris, red beans, and rice. The debris in the sandwich also is popular solo; it consists of the beef chunks that fall into the gravy during roasting. Added to the menu by the Amatos after they purchased the restaurant were jambalaya, gumbo, bread pudding, and other seafood platters (“Just Like Mother’s Used to Make.” Restaurant Business. (1992): p72. Print. 2 Nov. 2011). In 2002, Amato opened up a sister restaurant, Mother’s Next Door. 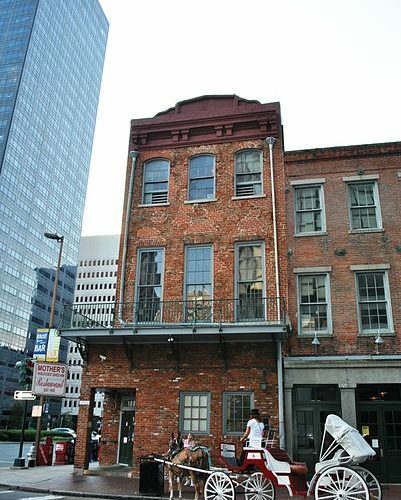 The 175-seat addition features two private dining rooms and is available for rent for breakfast, brunch, and lunch, among other things (“Mother’s Next Door Expands Cajun Concept”. Nation’s Restaurant News. (2002): p28. Print. 2 Nov. 2011). On August 29, 2005, Hurricane Katrina devastated the city of New Orleans. As a result, many of its restaurants shut down, some for good. However, Mother’s owners and employees returned to the restaurant around the middle of September of 2005, fortunately to find only minor damages. The roof was in need of repair, but other than that, the biggest loss the restaurant suffered was food. Because of a lack of electricity, about 5,000 pounds of fresh products were spoiled. In the midst of the storm, Mother’s was able to feed cleanup crews and residents who were rebuilding seven days a week from 8 a.m. to 2 p.m (“Mother’s Restaurant Cooking Again in N.O”. New Orleans CityBusiness. (26 Oct 2005):n.page.Print. 12 Nov. 2011). The restaurant was reopened on October 15, 2005 (“Hurricane Katrina”. Mother’s Restaurant (2011): n.page. Web. 31 Oct. 2011).